Jessiefaye L. Thornton, 92, Atchison, died Sunday, April 7, 2019, at the Atchison Hospital. Funeral services will be at 11 a.m. on Saturday, April 20, 2019, at Shiloh Baptist Church with Rev. Tim Wolfe officiating. Interment will follow in Mt. Vernon Cemetery. The family will receive friends from 10 until 11 a.m. at Shiloh Baptist Church on Saturday, April 20. Memorial contributions are suggested to Shiloh Baptist Church and may be left in care of Arensberg-Pruett Funeral Home with whom the final care has been entrusted. Born in Elwood, Kansas, to Georgianna Favors Chambers and Leonard Brown. She accepted Christ at an early age. Jessiefaye attended the Elwood schools during the early years. She loved spending most of her time at the home of her grandparents, Thomas and Edna Favors. 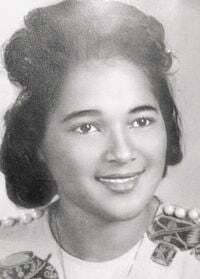 Her family later moved to Wathena, Kansas where she graduated for high school in 1944. On Oct. 25, 1947, Jessiefaye married William H. Thornton in Elwood. The couple made their home in Atchison, where she become a homemaker. In addition to being a homemaker, Jessiefaye worked diligently in her church. The earlier years, she sang in the choir, worked in the Mission Department and later on the Usher Board. Jessiefaye also was found on the kitchen committee, known for her Lemon Meringue pies. Jessiefaye loved attending the Annual Northeast District Association in various cities. She later worked for the Saunders Mfg. Company until her retirement. After retirement, Jessiefaye could be found cheering for the Kansas City Royals and the KU Jayhawk mens basketball team. She leaves to cherish her memories, one son, William (Rozetta) Thornton, Atchison, Deborah (Gregory) Henderson-Green, Topeka, Kansas, Christel (Stanley) Oliver, Lithonia, GA, Haregwoin Jo (Junious) Goodwin, Olathe, Kansas; seven grandchildren, Jason Goodwin, Brandi (Kyle) Doucet, Stanley Oliver Jr., Nicholas Oliver, Holli Faye Henderson, Johnathan (Angela) Oliver, Gregory Green II; and great-grandchildren, Jasanel Goodwin and Kayl Doucet. She was preceded in death by: her parents, Georgianna (Sis) Chambers; and stepfather, Robert S. Chambers; husband, William H. Thornton. As published in the Atchison Globe.